Some of our readers will remember the Neofonie WeTab tablet that we featured on the site a while back, the WeTab was due to hits the stores in June 2010, but it looks like it has now been delayed until September. 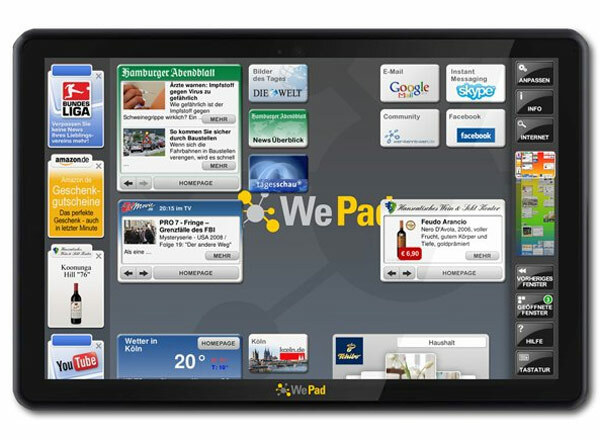 The WeTab Tablet runs on Google’s Android platform and features an 11.6 inch touchscreen display with a resolution of 1366 x 768 pixels. It features an Intel Atom N450 processor, plus Intel GMA 3150 graphics, and comes in a range of different storage sizes which include 16GB and 32GB of storage. There will be two models available a WiFi model and a 3G model. The Neofonie WeTab will cost 449 Euros about $573 for the 16GB WiFi only model, whilst the 32GB WiFi and 3G model will cost 569 Euros about $726 when it goes on sale in September. Have a look and our article on Android vs iPhone to see which smartphone and mobile platform is best for you.